boring announcements one after another. Today I read a couple of articles that got me more excited. 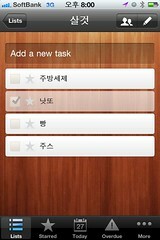 The first being Remember the Milk adding Siri support for adding tasks! There are two reasons why this excites me. 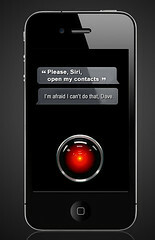 The first is that Siri is a great new voice activated technology Apple released. As I don’t have the iPhone 4S, it doesn’t really apply to me, but that’s not the point. If Apple can come out with such a cool virtual assistant, it is only a matter of time before Jailbreaking App developers come up with a good copy! Or, it is released for the 3GS and iPhone 4. The second reason is the Remember the Milk is moving very quickly in their development! This is a great bit of news. One of the reasons is that with the new iOS5, Apple has created a very accurate location based task management system. It should be something Remember the Milk can integrate into their Location based tasks. I can’t wait! It is such a wicked new feature. Can you imagine having your phone give you a reminder based on when you approach or leave certain places? Here is a blurb from Remember the Milk discussing the new Siri features they’ve integrated. From the moment we tried Siri on our shiny new iPhone 4S, we knew we had to teach Siri to add tasks to Remember The Milk. A few caffeine-fuelled days later, and we’re super excited to announce that we’ve done just that! You can now ask Siri to remind you (e.g., “Remind me to pick up the milk”), and that task will be magically added to Remember The Milk. via We taught Siri to add tasks to Remember The Milk – Remember The Milk Blog. The next announcement I read was that Google is only days away from adding their business based Google Apps accounts to the Google+ fold. Though I haven’t felt Google+ has been the Facebook killer that I’d hoped, it can still improve and offer it’s users a unique social network. I’m much more satisfied if I can use my main Google account instead of an old Gmail account. Google has announced that Google+ will support Google Apps accounts within the next few days.Google SVP of social Vic Gundotra said Google Apps support was coming “imminently” during a Q&A at the Web 2.0 Summit in San Francisco. Gundotra made it clear that “imminently” meant within the next few days.The reason Google didn’t launch Google Apps support during the original release of Google+ was because the company thought “it would have more time.” Google+ beat their expectations, though, and has forced them to scramble on what is Google+’s most-requested features.Google also announced that Google+ will soon support pseudonyms, though nobody should expect that to roll out in the next few days. via Google+ To Support Google Apps in Next Few Days. Next PostNext Google has been on fire with announcements! I’m Excited!